I have always been filled with awe at the incredible complexity of earth's systems, and a deep curiosity to understand how those systems function. This curiosity was sparked while studying the landscape distribution and characteristics of vernal pool wetland ecosystems in Nova Scotia during my undergraduate degree, and continued while working to unravel the controls on opportunistic wetland formation in the Alberta oil sands for the purpose of landscape reclamation. A truly interdisciplinary field, wetland ecosystems demand consideration of climatic, topographic, hydrologic, geologic, and ecologic interactions at multiple temporal and spatial scales. Studying wetland ecosystems has primed me for biogeochemistry and my project in the Tank lab. 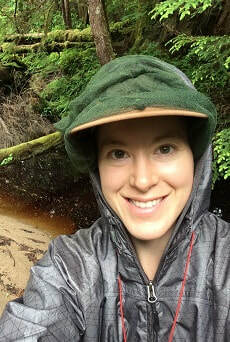 I study the flux of dissolved organic carbon (DOC) and CO2 gas exports from streams in BC's Pacific Coastal Temperate Rainforest, using data primarily from high-frequency, automated in-situ fDOM and CO2 sensors. The complexity of the soil-freshwater interface and the ecological effects of carbon cycling in such a biodiverse region both inspire and motivate me. Outside of research, I am actively involved in permaculture projects in and around Edmonton. I enjoy yoga practice, music, and learning about edible/medicinal properties of native plants.